Grebes – Catch of the day! 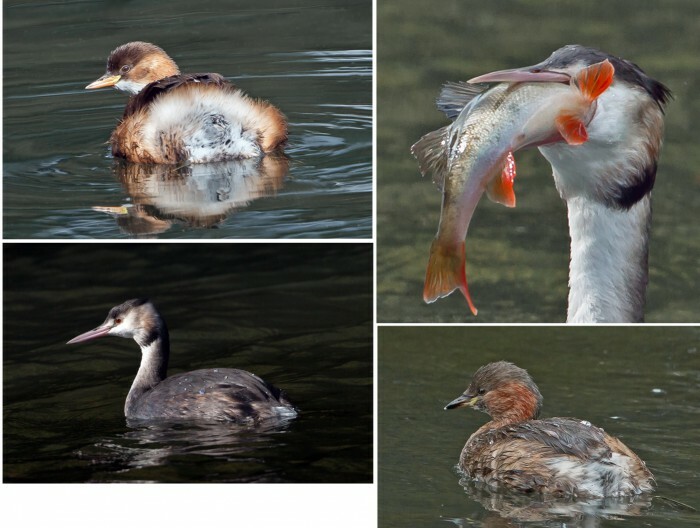 Two species of Grebe could be seen on The Vyne ornamental lake recently – Little Grebe and Great Crested Grebe. The former have bred successfully this year but the last time Great Crested Grebe bred successfully was in 2012. Last year a nest was built but abandoned and until late August this year, Great Crested Grebes were occasional short-stay visitors. Then a singleton took up residence and stayed for nearly 2 months before taking its leave. With luck it will return – hopefully with a mate and we will be treated to their elaborate and beautiful mating ‘dance’. In both Little and Great Crested Grebe, sexes are indistinguishable but there is a considerable difference between summer and winter plumage. In spring, Little Grebes develop rich chestnut panels on their neck and face which disappear in winter while Great Crested Grebes develop black and deep orange plumes on their heads which again, disappear in winter. At 25-29 cm. Little Grebes are the smallest adult birds on the lake: rotund and highly buoyant, they bob around like corks even in the slightest ripples. Their presence is betrayed by loud, pony-like ‘whinnying’. Great Crested Grebes are elegant birds with long necks, held upright when they swim. At 46-51 cm. long, they can look quite large but are actually slightly smaller than Mallards. Less vocal than Little Grebes, they do make grunting and croaking noises during the mating season. Thankfully now quite common, the Great Crested Grebe population plummeted in the 19th century through egg collecting and the use of feathers to make ladies’ hats. They were one of the first birds to benefit from the formation of the Royal Society for the Protection of Birds. Both Little and Great Crested Grebes dive for food and can remain underwater for 20 or so seconds, often surfacing a considerable distance from where they submerged. Their food consists of fish, aquatic insects, molluscs and other invertebrates. Both are capable of swallowing fish which seem disproportionately large, given their body size. In the photographs, the Great Crested Grebe is swallowing a large Perch. The Little Grebe is eating a small crayfish – probably a Signal Crayfish – an invasive American species which has displaced our native crayfish in many lakes, rivers and streams. 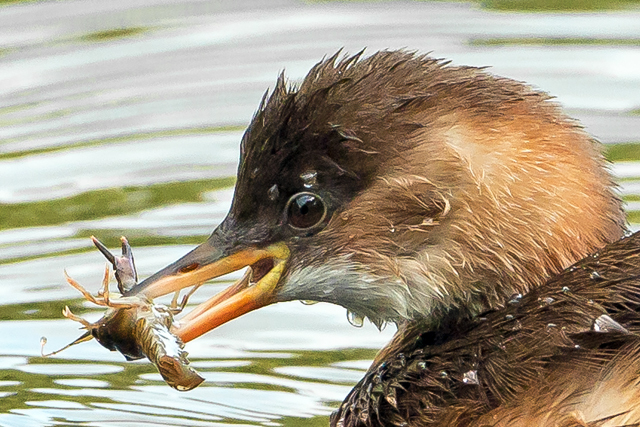 Little grebe tucks into what appears to be a small Signal crayfish – Copyright James Meikle.